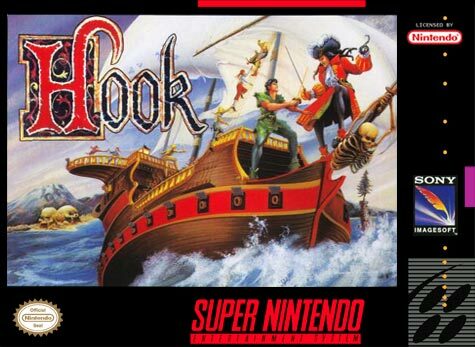 Based on the hit movie, Hook for Super Nintendo has you play as Peter Banning, a modest man with a secret past. After Captain Hook kidnaps your children, you revert to your childhood alter ego, Peter Pan, and embark the most important journey of you life. As you make your way through forests, caves, caverns, towns, lagoons, icy regions, and the Nevertree, you'll have to deal with Hook's minions who have been ordered to stop you at any cost. For 1 player.